Omaha's Douglas Street Bridge was for years the only Missouri River highway crossing between Omaha and Council Bluffs. Forced to traverse congested downtown streets on both sides of the river, frustrated motorists agitated often for another bridge. In 1931 Omaha floated a $2 million bond issue to build a bridge in South Omaha. But when bond sales lagged in 1933, the city formed the Omaha Bridge Commission to secure a loan and grant from the newly formed Public Works Administration. Kansas City engineers Ash, Howard, Needles and Tammen originally designed the bridge in 1933 with seven 400-foot spans, with approach viaducts totaling about 1,900 feet. The War Department was planning to alter the river's course, however, to correct a channel split near Omaha that posed navigation problems and eroded valuable Iowa farmland. The new configuration of the river prompted the engineers to re-design the South Omaha Bridge with two 525-foot, continuously supported, Warren through spans and a series of Warren deck truss approach spans. In the spring of 1934 a $1 million contract for construction of the superstructure and substructure was awarded to the Kansas City Bridge Company. With the river as yetre-channeled through the bridge site,the contractors were able to build the piers and erect the massive trusses over dry land, providing a curiosity for local sightseers. A concrete manufacturing plant was established near the site, and sand and gravel for aggregate was secured from the Platte River. Superstructure construction began at the Omaha end and worked eastward. All connections on the silicon steel trusses were riveted. The bridge was opened to traffic on January 18, 1936, and the river soon flowed under it. User tolls were dedicated to paying off the construction loan, which was accomplished by September 25, 1947. The bridge has functioned as a regionally important, free crossing since that time. A plaque on the main truss of the O Street Viaduct reads: "Constructed by the Union Pacific R.R. Co. and the Union Stock Yards Co. 1904." The truss was apparently moved to this location at that time, having been erected as part of a railroad bridge elsewhere in the 1880s. The viaduct's west approach originally consisted of 25 stringer spans that rose from ground level to the elevation of the through trusses. This ramp was replaced in the 1920s by the existing concrete slab approach in conjunction with development of a viaduct for unloading cattle and construction of the new Livestock Exchange Building. The eastern girder and stringer approach spans appear unaltered. 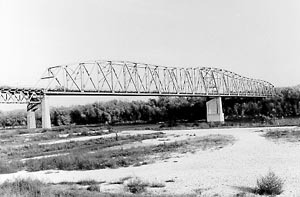 Whipple trusses were popular for 19th century railroad bridges across the Missouri River, many of which were designed by engineer George S. Morison. Few have survived, however, distinguishing the O Street Viaduct as a rare intact example of this important structural type. 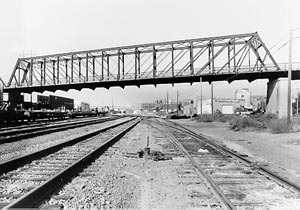 The viaduct is also important for its role as the only historical access over the railroad tracks to the Union Stockyards, established in the mid-1880s by prominent Omaha businessmen. This overpass and the adjacent cloverleaf were built as part of a federal aid project that the Department of Roads described in its 1933-34 Biennial Report: "The Dodge Street project . . . consisted of widening the street from Thirtieth west to the city limits, making a four traffic-lane street between those points. Included in this project is a complete, modern street light system, and interlocking traffic control signal system, two pedestrian subways, and a grade separation of Dodge Street and Saddle Creek Boulevard." 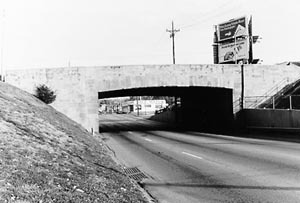 The Department designed this overpass as a concrete rigid frame structure, faced with curbstones salvaged from Dodge Street. Completed in 1934, the overpass required about 4,160 square feet of stone facing. Over 1,175 cubic yards of dirt were excavated to lower Saddle Creek Road sufficiently to pass under it. The Dodge Street Overpass is a noteworthy example of the type of structure produced under federal relief projects in the 1930s. The rising importance of aesthetics in highway design is reflected in the reuse of stone curbing for bridge facing and in the rigid frame design, chosen because of visual as well as functional concerns.